In a world of seven billion people, with thousands of years of recorded history, it's hard to be the first at anything. 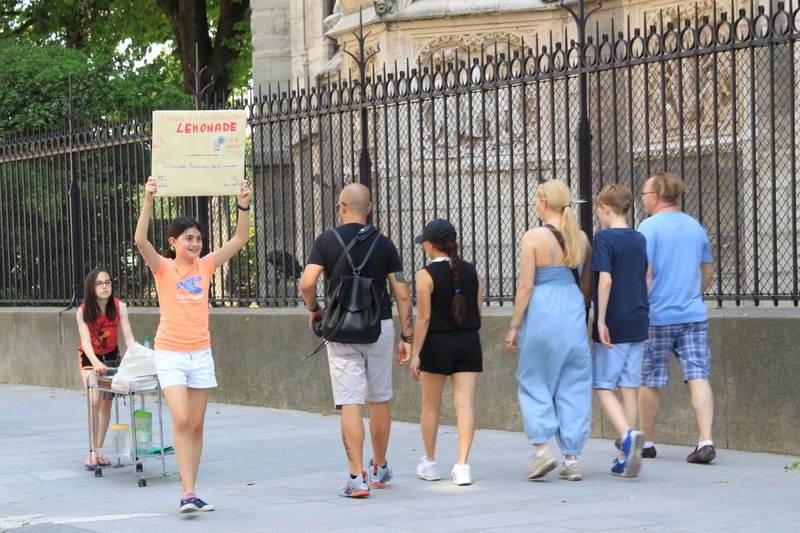 But I'd like to think that Gigi and her friend are the first, in the 850 year history of the cathedral, and, frankly, in the history of the world, to operate a roving lemonade stand in front of Notre Dame. When my sister was young, she once had a lemonade-and-brownie stand and my mother made her pay back the cost of the brownie mix. At which point she cried that she had no more profits left. My sister maintains to this day that it killed any entrepreneurial spirit she might have had. Now I don't want to repeat the error, but I don't really want to be a chump, either: the girls have raked in 28€ each, but I'm out the 20€ I spent on supplies (lemons, cups, and bubbly water. I'm giving them the sugar for free). In the end, there is some bargaining: The entrepreneurial spirit seems high in both girls, but Gigi's French friend negotiates the hardest with me, bargaining me down to 5€ from each girl for expenses. And George W. Bush allegedly once told Tony Blair, "the trouble with the French is that they don’t have a word for entrepreneur." Just look at the line of people waiting for lemonade! American-style! Home-made! 75 centimes for still water and 1€ with bubble water! Ha, ha! Just kidding. Of course, this is the line to climb the towers of Notre Dame. The girls wish they had this sort of client base. Maybe someday. The hotter it gets, the higher the price goes. They're no dummies. They stay at this till their supplies run out, which by happy coincidence is the exact moment that the police officers come over and tell them they can't be doing that. What?! Cute little kids can't run a lemonade stand on a hot day? That's just so un-American of them. I am not there to witness the police intervention, but the girls tell me a lovely French woman came over and said to the police, while looking at the girls very pointedly, "That's OK, because the girls were just going home. Weren't they?" Why yes they were, with nearly 60€ between them. Is this the first-ever RNDLS (Roving Notre Dame Lemonade Stand)? I'm pretty sure it is. Is it the last one? Now that the girls have figured out the system, and we're in the midst of a record-setting heat-wave, Gigi brings her sister on board for another lemonade stand. I foresee some very profitable times ahead. Chèvre du Montot is a raw goats' milk cheese made in a village called Oudry in the Saône-et-Loire department, in the Burgundy region, sometimes called the "little brother" of a Charolais. Montot is both the name of a neighboring village and also the name of the big local castle. The cheese is rather imposing, as small cheeses go, too: a barrel-shaped, nearly hard goat cheese that somehow is still creamy once melted in the mouth. It's hand-poured from ladles into a faisselle (sort of strainer), and then once in cheese-form, turned every day and dried on racks. It's aged three weeks, at which point it develops a nice blue-white mold. The flavors develop, too: not just the herbs, hay, and farminess of a good goat, but also a slight hint of mushrooms and lemony tang. The connection is simply that the Chèvre du Montot has a nice lemony tang to it. But for the love of God, please don't leave the Chèvre du Montot in the sun, and don't serve it on a roving cart to tourists on the square in front of Notre Dame.